'Desert Festival' OGB- (Lin Flanagan, R. 1994). Seedling 89026-1. AB, 26"; (66 cm). Early bloom. 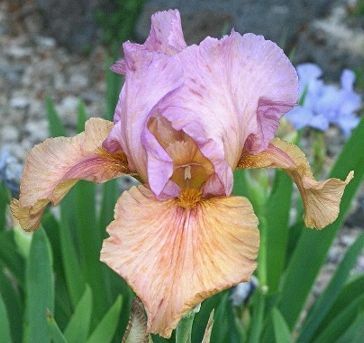 Standards pale violet; style arms violet; Falls golden tan, blended violet with darker rays extending from throat; beards pale orange gray; ruffled; Falls semi-recurved; no fragrance. 'Close Contact' X 'New Moon'. Aril Society, 1996.